With our family being an Apple family with iPhones and my daughter's iPad we were unfortunately down to one charging cord. One broke, one we leave in the car and the other was left to share among our three devices. I have been meaning to get a couple of extra cables but when I saw the prices and bad reviews in the Apple website I just didn't get to it. I tried buying cables from sellers on the street in NYC but most of them just stopped working after a short while. 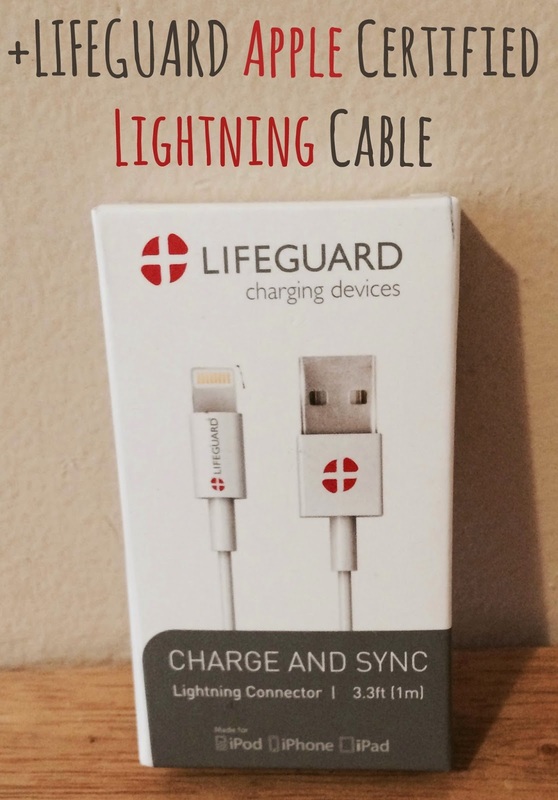 I got the chance to review the +LIFEGUARD Charge and Sync Lightning cable that is 1M long. It was the perfect opportunity for me to see if it really worked and didn't die out like the ones I purchased. First I liked that shipping was super fast and that it came in a little box and not that hard to open plastic packaging. As soon as I plugged it in, my iPhone started charging immediately and really fast. I have been using it for almost 2 weeks now and it charges just as fast as the one I got with my iPhone. With so many options on Amazon that may be cheaper but come from different countries and shipping that is insane it is good to know that the one from +LIFEGUARD works! Apple Certified - This Cabe Is Certified By Apple And It Is Compatible With All Apple Devices That Work With Lightning Connector. Compatible With: Iphone 6 Plus, 6, 5s, 5c, 5 / Ipad Mini, Mini 2, Mini 3, Air 2, Retina / Ipod 7th Generation And 5th Generation. If you need an extra cable or need to replace the one you got I highly recommend checking out the +LIFEGUARD Charge and Sync Lightning cable sold on Amazon. We are an apple family too with all of our iPhones and iPads. I'm sure at some point we'll need to replace some cables, and good to know what to look for. Who couldn't use an extra cable! What handy gadgets!